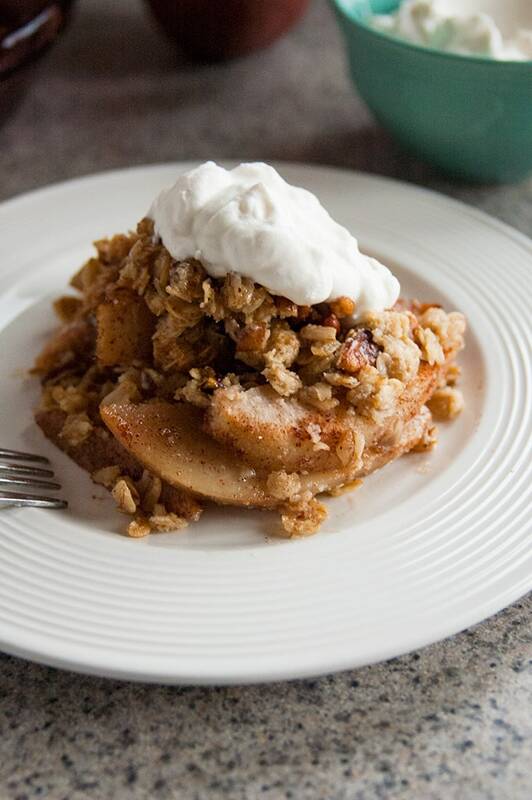 You have to try this Awesome Gluten-Free Pear Crisp! It’s vegan too and made with no refined sugar. We love this guilt-free, healthy dessert! If you don’t tell anyone this pear crisp is vegan, gluten free, and contains no refined sugar, no one would ever guess. And, they’ll be so busy shoveling in mouthfuls of this nutty, crunchy, salty-and-sweet dessert with cinnamon-spiced pears, they’d probably wouldn’t hear you, anyway. But if you can’t resist blurting it out (who, me? ), when your announcement registers, they’ll gleefully go for seconds. Since it’s healthy and all. At least, that’s my excuse for devouring half a pie plate of this awesome, gluten-free pear crisp. Let me break it down for you so you can understand what I’m talking about. You’ll start with ripe, sweet pears (it’s OK if they’re a little firm, but best if they’re a little soft.) You’ll peel and slice them up and toss them with cinnamon. Then, you’ll make the most delicious, gluten-free streusel topping, using whole-food ingredients. By that, I mean oats (use gluten-free if needed), almond meal or almond flour, olive oil (yes! ), pure maple syrup and coarsely chopped pecans. And, last, but not least, a little salt, which will take us up the express elevator to salty-and-sweet dessert heaven. My family shouldn’t be surprised to find me shamelessly scarfing down spoonfuls of that crisp topping. It’s basically granola, right? I keep almond meal/flour (that’s my Amazon affiliate link) on hand in my freezer, just so I can make this gluten-free dessert. The original recipe called for blueberries and no cinnamon. 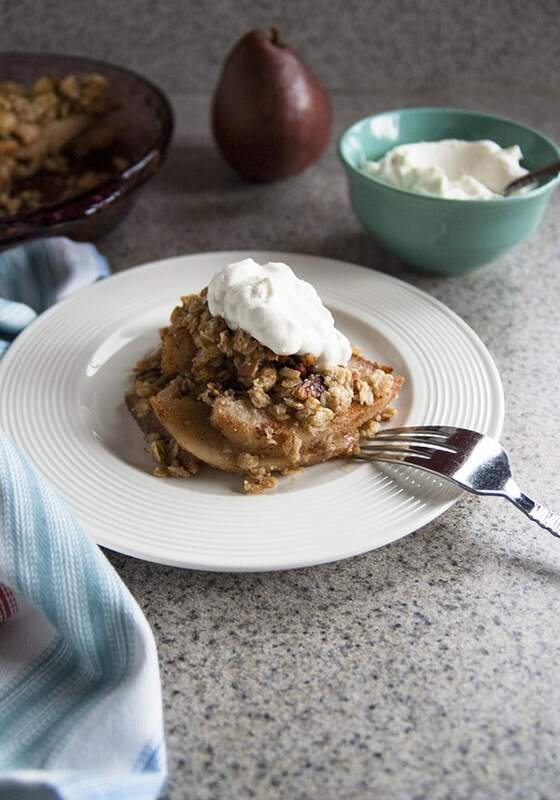 We enjoyed it, but liked apple crisp better, and now this pear version best. I had to add the cinnamon, which provides the perfect accent without overwhelming the other flavors. Tip: Store almond meal and alternative flours in your freezer to keep them fresh. Finally, I usually serve this awesome, gluten-free pear crisp naked. (I’m not sure that came out right.) I mean, no whipped cream or ice cream is necessary. However, I happened to have a lonely half cup of whipping cream in my fridge and decided the photos would look extra enticing with some whipped cream for contrast. I think it worked, no? P.S. If you like the idea of using pure maple syrup as a sweetener, check out my Healthy Whole Wheat Blueberry Muffins and my Apple-Mozzarella-Pecan Salad with Maple Vinaigrette. A delicious, healthy dessert that's gluten free, vegan and contains no refined sugar! Adapted from Shauna Niequist. Heat your oven to 350 degrees F. Rinse and peel your pears. Remove the stems. Slice the pears (avoiding the core) into pieces about 1/3-inch thick. Place your pears in an ungreased pie dish and toss them with the cinnamon. Give your pecans a rough chop, so they're still chunky. 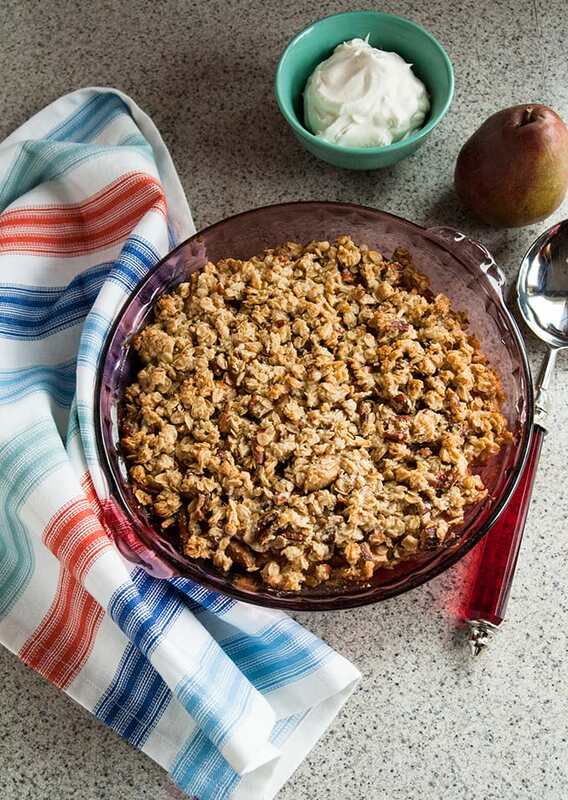 In a small mixing bowl, combine your pecans and all topping ingredients with a spoon or fork. Cover your pears with your topping, spreading it evenly. Bake for 35-40 minutes, or until the fruit is bubbling, and the topping is crisp and golden. Let the pear crisp cool for 10 minutes before serving. Store leftovers covered at room temperature for up to a week, but they'll probably be gone quickly. This is so good plain, but if you don't need it to be vegan or lower in calories, you can add whipped cream or vanilla ice cream. 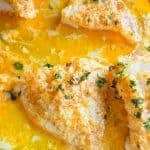 This is a super easy and delicious recipe. I made a few substitutions based on what I had – I used walnuts instead of pecans and coconut oil instead of olive oil. 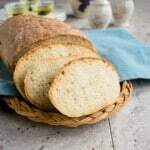 Thank you for sharing this amazing recipe, will definitely be making this again! Hi HB – It’s good to know walnuts and coconut oil work here too. I’m glad you enjoyed this dessert! It’s one of our favorites. This dessert doesn’t need one thing. It’s just gorgeous and sounds delicious. I love pears and crisps of all kinds! This should do it, Donna! Haha…I think it’s okay to serve it naked as long as you don’t take photos of that for your blog! 😉 But seriously – this sounds wonderful! 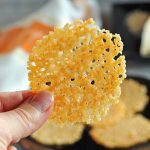 I love crisps because they’re so much healthier and EASIER than pies! 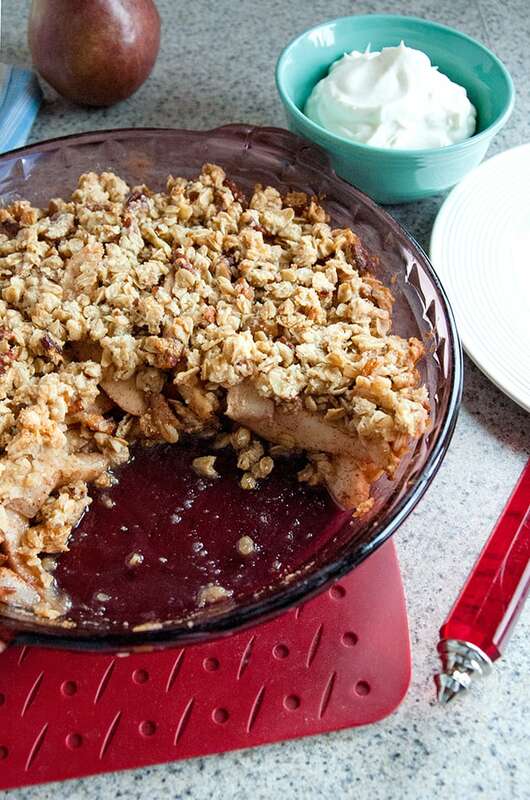 I make mine in much the same way, but I’ve not made a pear crisp before…my husband will love this! Hahaha!!! I swear that phrasing happened by accident, but then I had to leave it in. I agree, crisps are so easy! 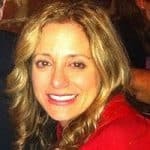 I hope your husband enjoys this, Lisa! 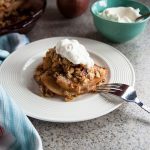 I recently made a gluten free apple crisp that everyone raved over, so I know that a pear version would be equally welcome. I love that you’ve not used refined sugar here too! Lovely! It’s exciting to make something delicious and guilt free that gets rave reviews. Thanks, Lisa! Yum, pear and cinnamon are two of my favourite flavours, if only the pears we got last week had ripened! 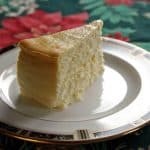 And I can’t believe you mentioned lonely cream, it’s the excuse for many a cake here! Haha! We must make all the things to prevent lonely cream, LOL. I’ve made this with pears that were pretty firm, and they actually softened a bit by the next day after baking.